Skype phone is only a simple tool for most people. However, it has just changed someone’s fortune. Daniel, the boss of an e-commerce firm, was saved by Skype phone from bankruptcy. Two years ago, because of the financial crisis, it decreased rapidly in the sale volume of Dan’s company. Like many other companies, the profits of products were much lower than that of cost. What’s worse was that he even can’t afford the suppliers. When he was just in fidgets, a gift from his friend Steven had just rescued him. It was a new USB phone, a kind of Skype phone. Although he had no experience in the device, he had spent only one hour to achieve the ability to use the phone. Suddenly, an amazing thought went through his mind. Why didn’t I change the devices of call center? After that, he set about purchasing several USB phones. The great cost saved from call center devices really made him feel easy to go on his work. With testing for a week, he was surprised to find that the sales volume increases unexpectedly. He thought maybe in financial crisis, many users are still worried about the expense of phone calls, especially for foreign users. They had received more calls from Skype messenger. Furthermore, Skype phone also provide a good condition for operators to deal with more work on the computer, such as setting up and managing the customer database. 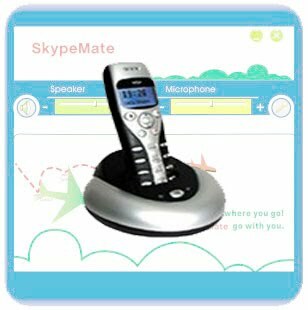 With free software, skypemate, every call had a good voice quality. All these produced a happy company with higher efficiency. Even if Dan has recovered his business of call center, he exclaims that without Skype phone maybe his company has already gone bankrupt. Now he not only needn’t to recruit but capture opportunities in a short time.